• Glucose (C6H12O6) is a ubiquitous fuel molecule in biology. It is oxidized through a series of enzyme-catalyzed reactions to form carbon dioxide and water, yielding the universal energy molecule ATP. Due to its importance in metabolism, glucose level is a key diagnostic parameter for many metabolic disorders. Increased glucose levels have been associated with diabetes mellitus, hyperactivity of thyroid, pituitary and adrenal glands. Decreased levels are found in insulin secreting tumors, myxedema, hypopituitarism and hypoadrenalism. Simple, direct and automation-ready procedures for measuring glucose concentrations find wide applications in research and drug discovery. BioAssay Systems glucose assay kit is designed to measure glucose directly in serum or plasma without any pretreatment. The improved o-toluidine method utilizes a specific color reaction with glucose. The absorbance at 630nm is directly proportional to glucose concentration in the sample. The QuantiChrom? Glucose Assay is based on the formation of a blue-green complex between D-glucose and o-toluidine. The carbonyl group in the open aldehyde form of D-glucose condenses with the amino group of o-toluidine to form a stoichiometric colored imino adduct. 2. Does this assay measure fructose? The reaction is specific to aldosugars (such as glucose) but not ketosugars (such as D-fructose). 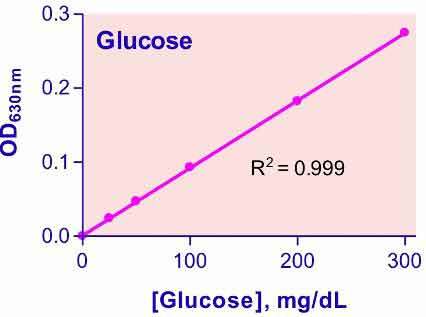 For instance in an equimolar solution of glucose and fructose, this method will measure only glucose. 3. What other sugars interfere with it? Aldosugars would interfere in this assay, such as glyceraldehyde, ribose, arabinose, xylose, mannose, galactose. However, as glucose is the main sugar in biological samples (e.g. serum, cell culture medium), the interference is most often negligible. 4. Does phenol red in culture medium interfere with the glucose assay? No, phenol red in the culture media does not interfere with this assay.